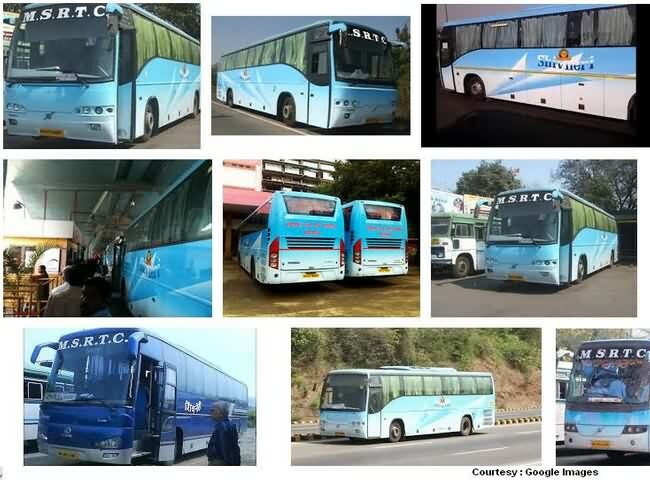 MSRTC operates Non A/C Asiad buses around Maharashtra (Also see details of MSRTC buses Vasai Virar) along with delux and Air Conditioned buses in the name of Shivneri. This are luxurious Volvo buses which has be deployed for services between Mumbai and Goa just like they started their MAHABUS service for pune. This AC buses will sure give relief to villages between source and destination which falls under Konkan region. MSRTC has planned a good route and bus stops to 4 villages falling in between before reaching Mapusa. Kindly note that these stops are as declared by MSRTC on bus service release date and can change with time. More bus stops can be added in future. Approximate bus timings and distance from Mumbai to reached Chiplun is 4 Hours for 247 Km, Rajapur is 7 Hours 27 Minutes for 384 Km, Kankavli is at 8 Hours 19 minutes taking 484 Km, Sawantwadi is 8 Hours 30 minutes covering distance of 520 Km. Note : Do you know about BEST AC Buses from Terminal 2from Airport and All those BRTS AC buses. Individual Ticket cost ranging from Rs.711 and Rs.1460, Below are Bus fares from Mumbai to Goa (Distance 564 to 574 Km) and other locations in Konkan district as listed below. From Mumbai Central Starting at 8:00 PM and Reaching Panji at 7:00 Am Next Day. From Panjim Depot Starting at 5:30 PM and Reaching Mumbai Central Depot at Early Morning 5:00 AM Next day. Below is the Route / Bus stops by MSRTC for these A/C shivneri buses and also an alternate route as per Google map. Distance between Mumbai Central and Panji in Goa ranges between 564 to 584 Kilometres when bus goes via two different routes (See Map) taking time of 10 Hours and 54 Minutes (Via NH4) while other route takes 10 Hours and 6 Minutes (Via NH66). Starting at Mumbai Central Jehangir Boman Behram Road and Sofia Zubair Road to Kutbe Kokan Makhdoom Ali Mahimi Flyover in Police Colony takes 9 minutes (covers 1.4 km) Take Eastern Freeway and Kodambakkam Highway to Pen on Khopoli Road Exit from Kodambakkam On Mumbai Highway takes 1 hour 19 minutes (Covers 75.7 km) Next Follow Khopoli Pali Road On NH66 in Patansai which takes 53 minutes (Covering 41.7 km). Take left turn on towards NH66 and go past the petrol station (on the left 49.2 km) It takes 1 hour 11 minutes (Covering 61.0 km) Now follow SH96 and MH SH 272 to NH66 in Khavati which takes 53 minutes (For 36.7 km ride) Keep following NH66 on Mumbai Goa Road and Kochi Panvel Highway towards Goa taking 6 hours 27 minutes (For 344 km) Take Avenida Dom Joao de Castro and Fr. Agnelo Road to DB Marg in Altinho, Panjim which takes 8 minutes (2.9 km) and you have reached destination Panjim in Goa.